Fantastic course. Well paced. Interactive. In touch with the needs of the modern coach. Great course that made me think about the impact of coaching on young people. Excellent concepts and tactical approach addressing challenges faced by today's student-athletes. Course has high quality material. An eye-opening experience giving us a spiritually renewed outlook on coaching. Good coaches will get a reminder of the things they do that make them good coaches. I think this is an innovative program that helps not only new coaches, but also veteran coaches teach to & learn from the athletes that we spend so much time with. When applied, it gives all coaches an opportunity to have positive and long lasting impacts on the young people that we care about so much. Seeing and hearing Joe Ehrmann and Jeff Duke speak many years ago during keynote presentations at coaching conventions drastically improved my coaching skills. The 3D Institute brings together the coaching philosophies of Jeff Duke, Joe Ehrmann, and many others and teaches it to coaches worldwide so they can effectively reach the hearts and minds of athletes. Over the years, I have implemented many 3D strategies and every single one of them have been wildly successful in positively shaping the cultures of the teams I have coached. Any coach who is good enough to play a sport in college can pickup on any X's and O's they need to know in a day and many can talk about the X's and O's nonstop. However, the more challenging task is forging strong leaders and shaping organizational culture. Coaches who really want to develop leaders must be intentional about the process and the 3D framework shows you how to do so. I have seen too many coaches get into the game simply because they like the X's and O's. Not every coach I know will be willing, committed, and intentional about leadership development to the level 3D demands. The ones who are committed and intentional about leadership development will dominate the game and beyond. If I am ever the Head Coach of my own football program, 3D Coaching Certification will be mandatory for all of my assistants. It is that good. It is that necessary. I truly enjoyed this course. I was already doing a lot of this and my faith background tied directly into it, but I found this course very thought provoking, inspiring, and it made for quality self reflection. I would recommend to anyone. 3D Coaching is a game-changer and truly inspiring. Any and all coaches should take this course, no matter what your level of experience. Transformational is the perfect word! This program has molded me into the person I wanted to become, but had no idea how to get there. Best professional life decision I've ever made! Great insight into information I have never thought about. Very good information and gave me a lot to think about and ways to implement new strategies for growing my team. This course was great to help me see what areas I need to improve my coaching and great examples on how I can go about implementing each dimension. I am very happy to have gone through 3D Dimensional Coaching training before my High School baseball season has gotten here! It has given me many ideas and overall just a very positive outlook on coaching and our upcoming season. I have some new strategies to implement to try to connect with our athletes. This course was great in addressing how you as a Coach can impact student athletes on a deeper level. Excellent course made me reevaluate my coaching techniques and philosophies. The helps articulate the breadth of coaching responsibilities. The 3D Coaching program is a resource that every coach should take advantage of. To be honest, I thought it would be just something to check off that I did because I was supposed to. I've been coaching a long time and already know the benefits of some of the principles, but don't always make them a priority; this course opened my eyes to just how important it is to connect with the kids we coach and the ideas and resources are practical, proven ways I can incorporate today. This course was well worth my money. It gave me so many new ideas and perspectives to explore in my road ahead coaching. This Course change the way I will coach going forward. Great way to reset your mind on coaching and life! This course, although lengthy, was very beneficial and had a lot of great inspiring, thought provoking information. A lot of aspects I am incorporating already, but I will definitely be diving deeper into that 3rd dimension to better reach my athletes as a whole. This course is life-changing. I recommend it for every coach, regardless of sport or level. If you truly want to make a difference in the lives of your athletes, take this course now! This is a great awakening course for all, not just coaches or with sports! Outstanding course, I learned a lot and know I'll be a better coach because of this game charger 3D program. This course could be taken 3 or 4 times and one will still gather new information or take something different each time. Loaded with knowledge and wisdom. I liked the class a lot. I would highly recommend it to those seeking to further their education in the coaching field. Valuable course, especially when taking it with colleagues, as we had great dialogue and conversations to help with our reflection. 3D was a good course to take, its provide me with some great insight in helping my player develop. Coaches and Parents go over board from time to time but they need to slow down look at the bigger picture and understand what Sports teach you and this course shows that well. Eye opening, instead of a brunch of scraps, it is organized to bring all aspects together for the benefit of the kids as well team and coach. Taking this course gave me more reason to buy in as a coach to be fully equip to be able to give my athletes what they need from a coach in sports and in life. This course completely changed me from the inside out as a coach. Before I was coaching from a standpoint of what I thought would get desired results on the wrestling mat. Now I approach coaching as impacting an athlete’s character first. The importance of skill and/or perfomance is a lot less since I took the 3Dimensional Coaching course. This course was great , I was coaching primarily in the first dimension with some emphasis on 2nd and 3rd now I have gain more knowledge in being a better coach , a three dimensional coach. This course was awesome. It really opened my eyes and made think deeper on why I coach. What my true outcome is for my athletes. God put this course in my life at the right time. I did some of these principles and activities, but I was not intentional about it. I was a 1D coach that spent little time in the 2nd and 3rd Dimensions. Now I know that we all need to coach the 1st Dimension, but we need to be intentional about spending time in the 2nd and 3rd Dimensions. This is where your team really bonds together and cares for each individual on and off the field. Very thought out. Would recommend it to other coaches. After teaching and coaching for 16 years... I had grown frustrated and disillusioned with "sports/sports culture." I didn't like what I was seeing and I wasn't sure if I wanted to be apart of it anymore. But, thanks to this journey (course) it has been a spark that ignited my passion again. Thank you. This course was fantastic and I enjoyed going through it step by step and using everything I learned from here on out in my career. I really enjoyed this program. It has opened my eyes and allowed me to put in motion the things that I like in sport back into it. This is awesome. This course has changed my outlook on how to coach my athletes in ways I could never imagine! I have developed a new purpose and gained so many helpful strategies that I can not wait to implement with my team. I have been coaching for 32 years and was truly inspired by this course. 3D coaching dials you in on what is the most important job of a coach...that being developing athletes to be successful in all walks of life. This has been an outstanding and refreshing course. I have coached track and cross-country for 32 years and still truly enjoy it. However, listening to the content of this course has given me some new perspective and zest for my coaching jobs. very helpful. has given me a better understanding. Very effective course that gives you a different approach to coaching. Definitely learned some useful strategies and gained some insight on how to be a better coach. There is absolutely no doubt I would recommend this to all coaches but I also would have liked to have worked through this program as a part of my coaching endorsement in college. This has made me understand that it is not all about winning or losing, but the lifelong impression you leave on a young athlete. Excellent course. Absolutely puts the athletes welfare first. A great teaching tool for all coaches. . . and adults. This course made me think outside the box as to why/how I coach. I'm so glad I took this course! I value this program! I have always believed that building Relationships with my athletes and parents was very valuable. This program has made me see the value and beyond in how to coach our young athletes. I'm very excited to install these values in my program! At first I thought it was really corny, but the more I dove into this I found strategies and inspiration to things that I have always believed in. It gives purpose to sport. Life without purpose is not life at all. When teaching and coaching what people call the "millennial" generation, you are to give those athletes a purpose for what they are doing. This helped me in my journey to truly find my purpose. I liked the course. I would like a few more wrestling activities in the course but that is just the selfishness in me. I think this should be a require course for all coaches. This course was very thorough and enlightening. After coaching 20 years of high school sports, a lot of the information was very relate-able. I've been coaching for 9 years now and have taken plenty of coaching courses but this one really stood out to me. It focused on so much more than just the technical side or even the motivational side of coaching. I'm excited to incorporate a lot of these ideas into my training. This course provided me with strategies and ideas to become a better coach throughout the entire framework of coaching. The modules were definitely beneficial and helpful for my career. The 3 Dimensional Coaching framework is worth the time to improve yourself as a coach but more importantly as a person. Fantastic course! I love that it's teaching coaches to go the extra step, from two dimensional to three dimensional coaching. Kids today are hurting for more! They simply aren't getting it from home like they should. Coaches need to step up. The speakers were great! It took a while to complete tho. Information was very useful...love the ideas during practice. I enjoyed the information, just not all the start and stop for each module. Great course enjoyed going through the steps. Saw improvements each week to my teaching and coaching as I went through the program. Thoughtful exploration of being a good coach. Since becoming a coach at the age of 18, I've always known that my biggest weaknesses goes beyond teaching the fundamentals, the techniques, the movements of wrestling. I struggled year after year to find a way to fill the gaps in my coaching philosophies and practices. I'd had seasons when we nearly came out with top finishes for our program, and I'd had seasons when we nearly bottomed out. I always walked away with that bad taste in my mouth, that taste that would keep me up late at night questioning myself. Had I done the right things? Was I the right coach for this job? Was it time to step away and hand the reins to someone more able-bodied? Yet year after year, I received enough affirmations from parents and former wrestlers that I kept going. Through a series of difficulties and doubting moments, I happened to end up taking the 3 Dimension Coaching Course. I'm proud to say that much of WHAT I believed has been affirmed through the course, but even more so, I now have a much clearer idea and vision of HOW I can help my athletes. Thank you, from the bottom of my heart, for this incredible course. One of the most impactful lessons and tools for coaching. Best coarse one can take! I have been coaching for 46 years and I would highly recommend this course to any coach of any experience level. I am looking forward to incorporating several of the things I have learned from this course into my coaching this year! I had the privilege to hear Dr Duke speak at the NIAAA National Conference in Orlando FL a few years back and was amazed at the simplicity and truth of 3D Coaching. In a world of quick fixes and "flavor of the month", the frameworks of 3D Coaching are a refreshing breath of truth. It brings you back to core purpose of coaching. It helps you as a coach remember the calling and passion of our profession.....developing the athlete as a complete person. As an Athletic Director this helps align the "why" with the "what" and the "how". Great course, learned a lot and I now have some new tools to try out to make our community great! Thank you! This course allowed me to re-examine the different decision making methods I use with my kids and while I implement many of the aspects already in my coaching philosophy, this gave me some direction for a more logical path. I thought this was really helpful with pointing out areas of improvement that all coaches could use to re-focus their purpose. I think is a great course for coaches. Any coach that takes the time to do this will become a better coach. This invites you to care and show the kids they deserve the best. The things discussed in here will make you think about why you coach, and more importantly how to be better. The course was filled with lots of good resources, feedback, and practical ideas for coaches. More importantly, it allows coaches to reflect on the purpose of what they're doing and hopefully come up with a plan of action to be the best coach and person they can be. I enjoyed this course. It made me think a lot about my coaching and my coaching future. After 24 years of coaching, I felt beat up and was looking for any reason to exit coaching all together. My "Fire" for coaching was burning out! Throughout taking this course with my mentor Kane Ulrich, I started to find joy and excitement in my coaching again. This course was personally challenging and rewarding in many ways. It re-defined my purpose and the "why" I got into coaching philosophy. I am now excited to try many 2nd and 3rd dimension strategies with my middle and high school student athletes. More importantly, I cant wait to mentor younger coaches in 3D. I was thoroughly impressed with the content of this course and with the way it was SO effectively presented. Congratulations on having such a positive impact on our youth and our society! 3D Coaching is a must for any coach who wants to have success teaching the I-why generation. The most enlightening course I have ever taken. This is THE training that EVERY coach must have and can be applied to all aspects of life. 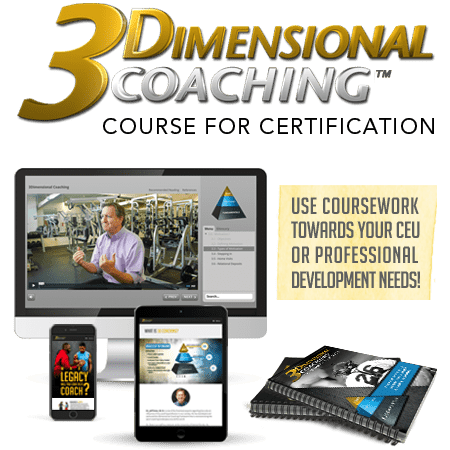 The 3D coaching course is a great course. There is so much information and by the time you get to the end you have to go back in the handbook to remember all the great teaching. Even if you are a coach that is doing may of these things already it really reinforces the importance of those 2nd and 3rd dimension aspects that make a team a great community for the athlete. It was interactive, very simple to understand and an eye opener. Information was necessary and good reminders for why a person becomes a coach and how much value that has on a player. This course was fantastic! It was was so informative. We are living in such an entitlement time right now amongst athletes and I had been struggling on how to handle that. Taking this course has helped me how to better handle the entitlement with my players. This course helped breath some meaning into my work. I look forward to implementing what I have learned. Great program! As a PE teacher and coach I feel we are missing the integrity and ethics component while in competition and practice. It is our job to teach that. The 3D coaching framework is the most complete and inspiring system for growing out of traditional, single dimensional, roles. If you are interested in growing your program and your personal achievement and believe those will be measured less by wins and losses and more by character and relationships this is the program for you. Youth coaches have tremendous influence in modern society and it is critical that every coach use that influence to help create better people that will in turn create better athletes and teams. I am looking forward to implementing some new coaching strategies that I have learned in this course. I recommend this course.... especially if you are over 40. Fundamentals of coaching that every coach needs. This is a series about how to approach daily life vs just about coaching. Excellent course that if nothing else bonded us as a coaching staff. I’m excited to see how implementing some of the things we have learned will impact our program. 3 Dimensional Coaching did an excellent job helping coaches realize the effect of things we often do without thinking, of the potential effect of coaching today how we were coached years ago. Faith-based integration made the course a two-fold success. As both a coach and a team-chaplain, seeing and hearing the connections between on-field and off-field transformational concepts was extremely valuable. I enjoyed taking it and I actually learned a lot that I can implement. This course will provide not only the impetus for change and improvement in your coaching, but the tools to bring it about. Be ready to take notes. This is a must for every coach. You are too busy not to take this training. Carve out the time and make this investment into your self and your Athelets. This course was awesome! A bit long at times but its content was fantastic. Learned a lot of valuable lessons and would recommend every coach takes it. The treinment was very important for me, because it led me to question why I'm doing what I do and how to stay focused, besides helping me with many points that I had never paid attention to in my work. Was very good. This is an outstanding course! If everyone who coaches, teaches or does any type of instruction would go through this course I believe it would change the world as we know it. Great material! I feel encouraged, inspired and ready to adopt the lessons I've learned to my coaching, marriage and parenting!! The course was very eye opening of the deficiencies I had as a coach and father to evaluate and speak to the 2nd and 3rd dimenesion of a person. I always thought faith and hard work is all you needed, but some how missed the aspect of a growth mindset in the context of relationships. This attitude kept me in the 1st dimension more than I ever realized. My child saw it as a performance issue instead of a heart issue and missed the whole part of me trying to bring faith and hardwork in sports. This was a great course, and I would highly recommend it to coaches and teachers. This is a great course. It makes you think about more than just the sport, more about what really matters and that is to make student athletes better in all aspects of their lives. I felt that this course did a great job in showing the importance of relationships with my athletes and how that can benefit my program. I found this course to be fulfilling in providing tools to better serve the young people we coach. 3D - Coaching is a priceless lesson in self - reflection for coaches while addressing contemporary issues of coaching today's athlete's. I think this course would benefit every coach who works with kids, regardless of age, gender, or sport. This course is outstanding. It is well thought through, structured and purposeful in leading coaches to a recognition of the gravity of coaching and development of foundational principles to impact sports in a positive, live giving manner. Great course that gets you to re-evaluate your role as a teacher and coach. This course can be used to help coaches, workplace managers, church leaders, parents and others become the type of influence on others that we all desire to be. This course totally brought me back to what Gods purpose is for me as a coach. I had lost that to results and got away from the process. Gods plan to bring me back to his desire for me was getting fired in 2015 after 27 years of coaching. Put me in a middle school as Athletic Director/Head football Coach, took the scales off my eyes to see the process and not the results. I am so thankful for FCA, Jeff Duke's book and this course. This course really brings you back to a reset point that inspires by getting you back to a clean slate clearing bad habits that developed over time. This program really made me evaluate why I do what I do. I have taken pieces and implemented them into my program and am excited to see the results. It was a tremendous blessing to walk through this course. I've been a coach and AD for over 25 years and this course helped me realize I still have a lot of growing and maturing to do so that I can help our students flourish on and off the playing surface. This has by far been the best decision I’ve made for my coaching career. I cannot wait to Coach this season! The 3Dimensional Coaching Course is simply amazing! Every coach should go through this course and implement it into their coaching. This is by far the best coaches training I have ever seen. The course was great. I'm an older coach, but I found that change is growth. And when you stop growing you stop living. Thank you 3D Coaching. This course was outstanding on so many levels. It has caused me to rethink my own ways as a coach, and also what I want my players to receive from me each and every season. It has also caused quite a bit of conversation between my wife and I at the dinner table - as she is also a coach and has been interested. Finally, the times spent with my fellow men going through this was a huge plus! This course gave me an excellent overview on how myself as a coach need to get out of the 1st dimensional phrase and move into the 2nd and 3rd dimensional levels. And to be more open to new methods to help athletes grow in their sport. Great course,...every coach at any level would benefit greatly from 3Dimensional Coaching. It will provide them with a better understanding of what it means to coach at different dimensions, it will help coaches grow in areas that they didn't realize needing growth. It will create a craving to coach. This course was very inspirational. It helped me come up with some great ideas on how to reach the kids on a deeper level. It is a great course that helped me become very confident in my coaching strategies and I feel very well prepared for the season. Making the transition from JV2 basketball coaching to the varsity level will be a seamless transition. This course is a very good tool for coaches to re-evaluate where think they are with regards to their individual ability or success in helping their student athletes prepare for their journey in life. I liked the course it just takes way to long to complete the entire course. Very good information, I also enjoyed the FCA aspects at the end of the modules. I feel I will be better as a coach from completing this training. Will probably help me with other aspects of my life as well. Exceptional training for not only beginning coaches, but veteran coaches as well. I truly believe that when implemented, this program can absolutely change the culture of not only your team, but your school and the surrounding community. I think this is a must for all Athletic Directors. Getting and using this for your coaching staff can completely change your program. I enjoyed going through this process. Most of what was spoken (taught) is what I have been noticing and truly opened my eyes. My heart/mind was ready to hear what was communicated during each module. I would say it showed me that my path and heart is in the right the right place to make a change and what is truly important. The student's athlete as a whole. I never was one to be just first dimensional but has always felt there was more. By going through this course allowed me to see more of the 2nd dimension and how to use the 3rd dimension. This course has given me so much amazing input on how to be a better coach. I liked the updated version, shorter videos are good. there was some repeated info at times, that seemed redundant. 3 Dimensional Coaching is very intentional in its purpose. Every coach should invest in the framework to fulfill the meaningful relationships our athletes so desperately desire. This course should be required for every coach as they begin their journey. As a coach of 20 years it was a great reminder of the power we have as coaches and to make sure we focus energy in the right places. I truly was blessed by this and know I am encouraged to go out and live it out. This course was very motivational for me. I feel inspired to employ more dimensions to my coaching with thoughtful intention, insight, and reflection. This course reminded of the magnitude of my position as a coach and the importance of relationships, joy, community, parent involvement, and spirit of sport. I look forward to this coming year as I connect with other coaches and work on my coaching purpose. I know this framework will have an impact on myself, the athletes, and the community I coach in. I highly recommend this coaching course! Thank you! Excellent! The purposeful reflection and very specific suggestions within the 2nd and 3rd dimensions have started me on a 3Dimensional coaching path. I would say I was dabbling in coaching in the second dimension and sticking my toes in the water of the 3rd dimension. The writing of a Transformational Purpose Statement and the strategies given will hopefully help me to "swim" in the 2nd & 3rd dimensions! This course really allowed me to take a look at myself as a coach, as well as why I do it. By knowing who I am as a coach, I can better serve and lead my athletes. This course was an outstanding way of looking into coaching the entire athlete. The way that the modules were put together and the material covered are top notch. Any individual who works with young people should take this course. Very long but detailed and full of great ideas. I have always known the kind of coach I wanted to be and that I strive to be. Now I have an actual name for that. A 3Dimensional Coach. I am excited to continue my journey with the resources and information I received in this course. I felt the course gave me a lot of insight on how to be a better coach and person. This is an incredible course that provides structure and a plan for positively impacting players in a transformational way. Great course to rethink and evaluate your role as a coach. This course touches so many other areas of life in addition to coaching. I find myself applying these 3 dimensional approaches in all parts of my life! I really enjoyed this course. It has opened my eyes to the reasons it is often difficult to deal with student athletes and their parents. It has also given me tools to deal with those issues rather then just complaining about them and waiting for them to change on their own. I would recommend this course to any coaches looking to empower their athletes. This program can transform a good coach to a great coach. Athletes need all 3 dimensions in order to perform their best! This course has helped me not only to become a better coach, but as a husband, father, and spiritual leader in our home! Excellent! I really came into this training wondering if it would teaching me anything new or if it would be anything I could actully use. I took something away from every module and I am not much more intentional when I coach. This course made me take a good long look at myself and figure out how I can better touch the hearts of my athletes. As a teacher and a coach, I am so thankful that I had the opportunity to take this course. I know the information presented will positively impact my students in the classroom as well as my athletes on the court and most importantly as a wife and mother too. Great men who opened their heart to help me become a coach who can transform lives! The presenters of this course did an amazing job of changing traditional views, and opening my mind and heart to new strategies and new processes for impacting kids. Loved it! Great course! Really caused me to reflect and change the path of my coaching throughout my program. I enjoyed this course. I liked the way Biblical truths were tied into coaching. This is a great “wake-up” for your life. It makes you pause and think about what you are doing now as a coach and how to reach your athletes. This course is outstanding, it really helps you understand the totality of coaching in this 21st century from all dimension to produce the best athlete, and a better you as well as coach. Lots of great ideas and suggestions to use for coaching and teaching. This is a good systematic way to understand how to teach and coach the whole player: body, mind and spirit. I've had a feeling for many years that we have sacrificed character development for winning at all costs. I'm a big sports fan for all sports(Steeler blood in my veins) and especially tennis. I had the honor of hitting with Rod Laver over 25 yrs ago, a great Grand Slam champion, and a true sportsman/gentleman. Roger Federer and Serena Williams are great current tennis role models, but there have been several in the past that have missed the mark. Thanks for this ongoing course and journey many coaches need to take! A great confirmation and reminder of what really matters when being a coach. This course inspired me to continue on the path of transformational coaching, and gave me more tools to do that. I enjoyed how this course really focused in on pushing coaches to view their players as more than just players. I really liked the way the course was broken down into stages. This allowed the information to be easier to be absorbed. This course allowed me to see the error in the previous way I coached and moved me towards a different heading. This is a great course to help you find yourself as a person and as a coach. I highly recommend this course to anyone who is interested in coaching. You will definitely understand how to deal with your athletes on different levels. Not only will this help me become a better coach by reaching my players on different levels, it will allow me to use this in all aspects of my life. I thought the principles which were taught to us were very enlightening. I wish I had this course 20 years ago when I first started as a head coach. loved the course, ty it help me get organized what I have been trying to do for years!! This course has allowed me to take time and think through the why questions of why I coach. It has allowed me to discover my true purpose in coaching and has given me avenues to implement that purpose. I am a blessed coach who has had the opportunity to experience much of what is presented in the 3d course. It is so important to be open to growth - and reminded of what is our primary focus - the athletes. All things are possible to those who love God and are called according to His purpose! Great Course! A must for all coaches! Course has excellent material, and has the potential to make significant changes in the lives of many coaches.